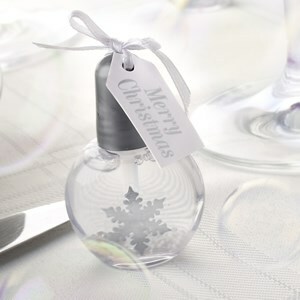 DescriptionGorgeous blow bubble pots with a snowflake on the front and merry christmas tag on top with hand tied ribbon. These gorgeous bubbles also have small white balls inside to give a snow globe effect when shaken. The perfect table decoration to amuse even the biggest of kids! Gorgeous blow bubble pots with a snowflake on the front and merry christmas tag on top with hand tied ribbon. These gorgeous bubbles also have small white balls inside to give a snow globe effect when shaken. The perfect table decoration to amuse even the biggest of kids!